Tom Hunter's landscapes in the series 'Life and Death in Hackney' are based on Pre-Raphaelite paintings. 'Vale of Rest' follows J.E. Millais' painting of the same name (1858) and 'After Party' follows Henry Wallis' 'The Stone Breaker' (1857). Both images were taken in the Lea Valley, Hackney, East London, and feature the travellers who use the area for open-air parties. 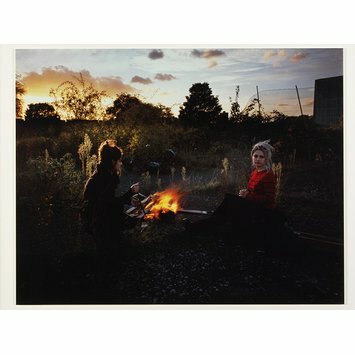 Colour photograph of two women sitting around a bonfire. 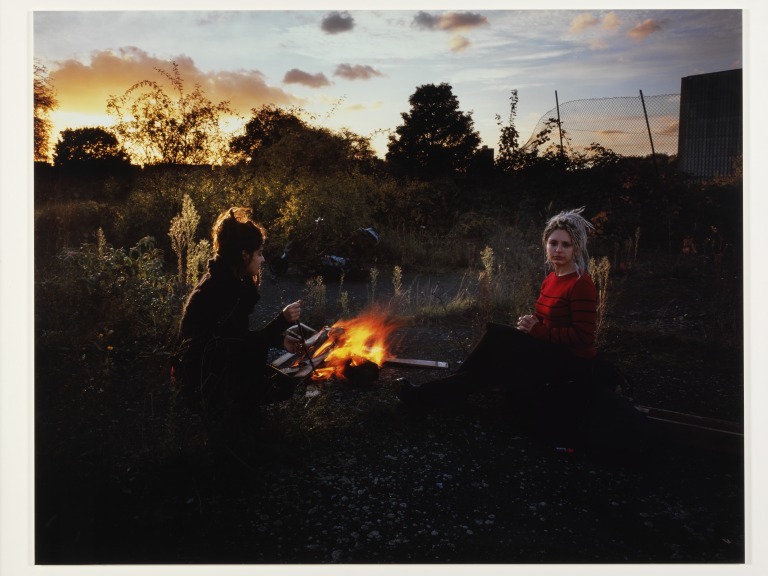 Photograph by Tom Hunter, "The Vale of Rest", colour photograph of two women sitting around a bonfire. The compositions of these staged tableaux are based on Pre-Raphaelite paintings by J.E. Millais and Henry Wallis. The photographs were taken in the Lea Valley, East London, and feature travellers, who used the area for open-air parties. Using dramatic natural lighting and rich colours Hunter presents a surprisingly beautiful version of an overgrown urban landscape.